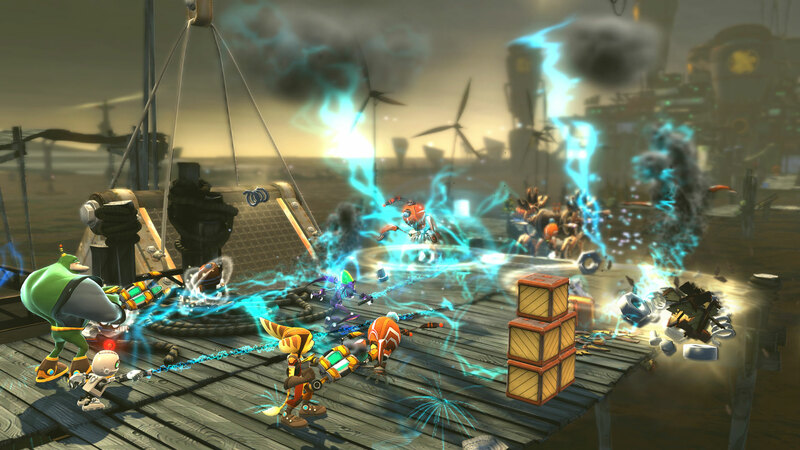 Ratchet and Clank has been around since the PS2 and was known for it’s guns, comical tone and stylish setting. But the Ratchet and Clank games have also all been solo besides the versus modes that were in a few of the games. All 4 One is the game that changes the pace for the series by making coop a requirement. Me and my girlfriend are always on the lookout for a good coop game, while the competitive games are always fun to play, coop games give a whole different experience. Lucky for us and any of you who are also big coop players, this month seems to be a heavy coop month with the releases of games such as Dungeon Defenders and Payday: The Heist and many more. 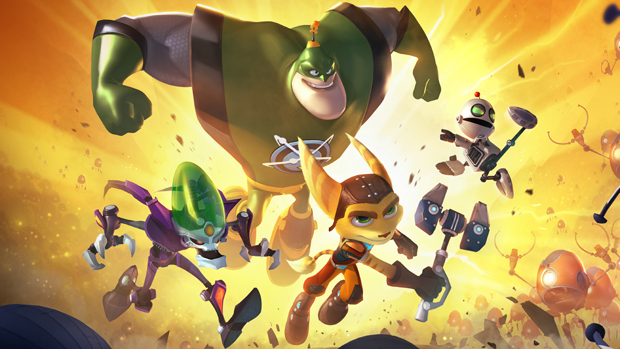 The Coop lineup kicks off with the release of Ratchet and Clank: All 4 One! All 4 One tends to go along the same path as the other Ratchet and Clank games as the story starts off as the heroes battling the evil Dr. Nefarious but the game somehow manages to bring him onto the good side and all four of the characters (Ratchet, Clank, Qwark and Nefarious) work through the game to complete various tasks. The game heavily emphasizes the coop by making parts of the game that requires more than one player to complete. Enemies are also killed easier and faster if more than one player is attacking the same one. And while all this is happening you are still competing to see who can get the most bolts to upgrade their guns! While playing through the game I was very much reminded of the fun the first time I played Castle Crashers and Little Big Planet as I laughed and had fun taking other players and sabotaging them by scooping them up in my vacuum and shooting them off the side. And I think that is one of the greatest aspects of this Ratchet and Clank being a coop game. While most multiplayer games are frustrating and irritating, this has more of a light tone and allows the players to have fun. But this does not go without saying a lot of the good things about the other Ratchet and Clank games are missing. One of the big things that I found disappointing in this game is that the story was barely intact at all. While I destroyed giant slugs and turned robots into cute little animals the cut scenes did not do a very good job of keeping the player updated with what was happening or even attempting to keep the players attention. Another problem is that the game play stops constantly. Throughout the game you are interupted every single time you do something, whether it’s to introduce you to a new enemy or just have a random character say something you didn’t need to hear, every time you destroy and wave of enemies or go to the next section of the level you will be interrupted and it is just plain irritating, especially for a multiplayer coop experience. The last thing that was different from the other Ratchet and Clank games, while not bad, was the style in graphics. I did not like the new look of Ratchet and Clank though it wasn’t bad and I understood why they changed them for this game. The art style has not changed drastically but more so become more cartoony and cutesy for a broader audience that have never been introduced to the games before. Some new players to the series may like the art style more for the cutesy lombax and robot. Overall the game is still very good and if you are a Ratchet and Clank fan you should still play it. For those of you who don’t have anyone to play the game with you can play alone and a computer player will follow you around and do the jobs you need help with, similar to the help you get from other AI in the LEGO games. If you are new to the series this might be the best start for you as this is the most casual entry in the series and the most light hearted.